Postać - Scoundrel - Leader. Punkty: 10/13. Wytrzymałość: 10. 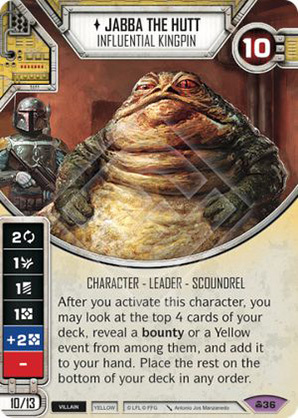 After you activate this character, you may look at the top 4 cards of your deck, reveal a bounty or a Yellow event from among them, and add it to your hand. Place the rest on the bottom of your deck in any order.